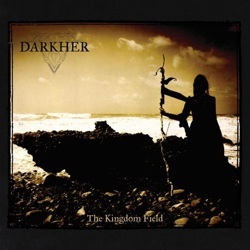 Dark folk project Darkher, the alias of Jayn H. Wissenberg, a singer-songwriter from West Yorkshire, will release its debut EP “The Kingdom Field” on November 14, 2014 via Prophecy Productions. This EP is Darkher’s first release on a bigger scale, since its first three tracks have been self-released by the artist before in a strictly limited print-run of only 100 copies. For this new release however they have been newly mixed and mastered and enhanced by the yet unreleased song “The Kingdom Field“. The EP is already available for pre-order in Prophecy’s e-shop as digipak CD edition and as 12″ vinyl EP (500 copies black vinyl, 500 copies white vinyl) with special vinyl mastering and incl. PVC protection sleeve. Album artwork and tracklist are also unveiled.